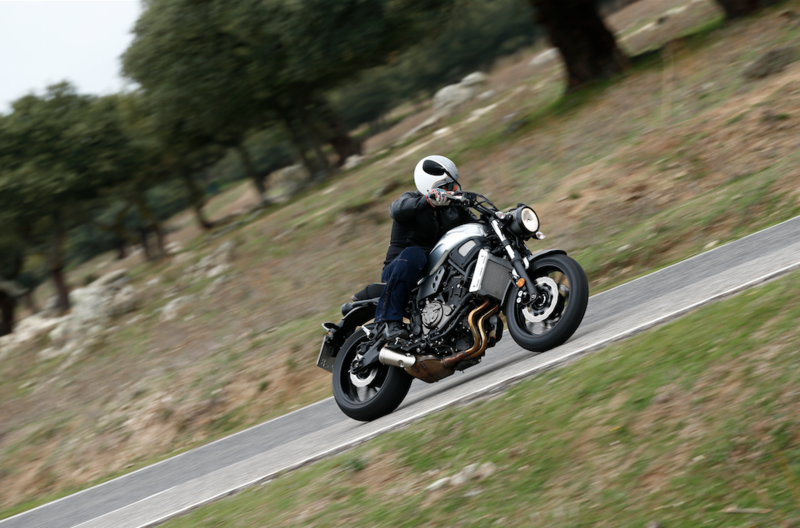 Yamaha XSR700 – Universe first review! The two hour panel based presentation from the team at Yamaha yielded some fascinating facts about the motorcycle market, many of which I’ll slowly pass off as my own over the coming months. 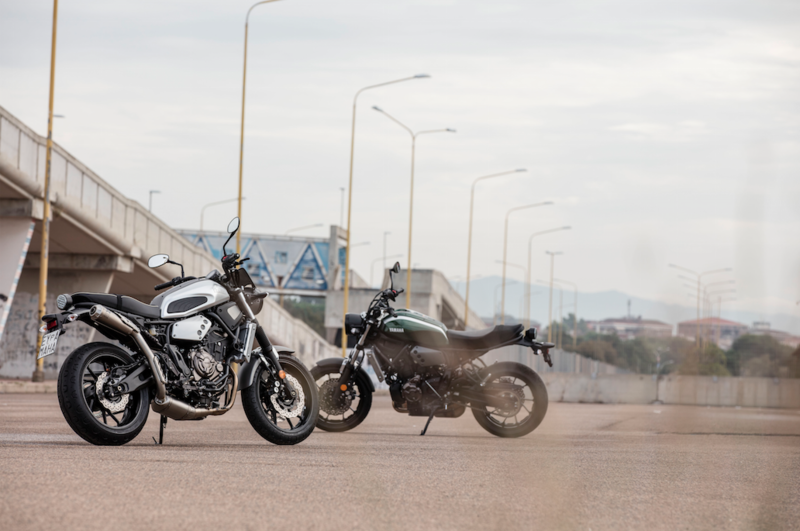 In short, the reason why they were presenting the Yamaha XSR700 to a room full of journalists was because the market is craving this kind of bike. Sports bike owners aren’t getting any younger and while lots of them appear to be willing to part with huge amounts of cash for a litre bike, others are looking for alternatives. Also, new bike buyers are seemingly more fashion conscious than ever and want something that allows riders to express their personality in more ways than an iridium screen and a matching visor will ever be able to. Retro style bikes have been around for as long as I can remember, but nobody quite managed to hit the nail on the head as squarely as Ducati did last year with the Scrambler. That bike has been a run away sales success and it makes perfect sense to me to expect another manufacturer to want to ambush the Land of Joy. 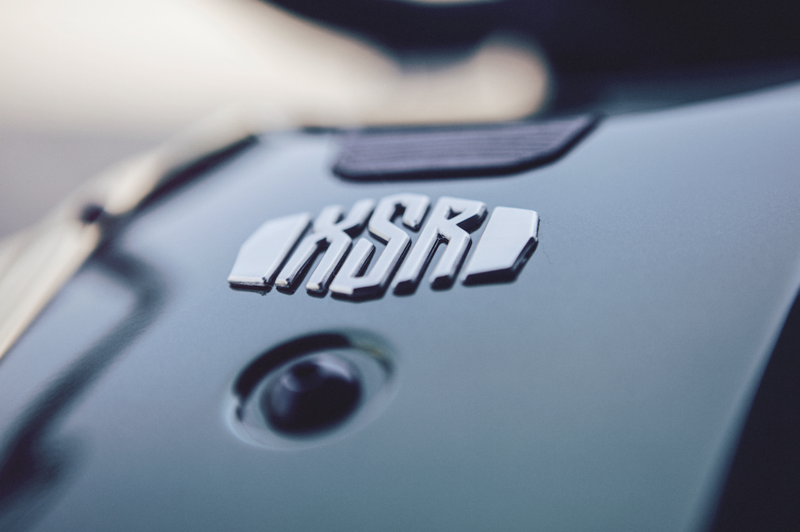 That’s where the XSR700 comes in. Until now, there hasn’t really been anything to compete with the Scrambler. 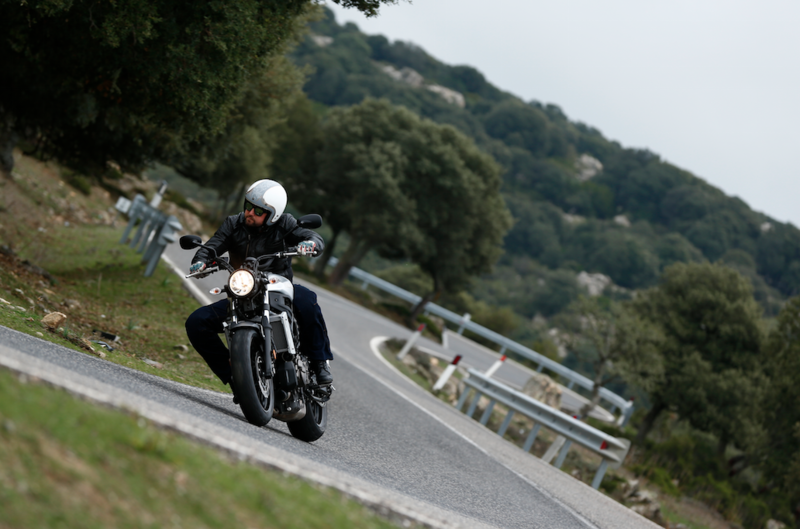 Sure there are plenty of new bikes out there that look old, but they either fail to match the Scrambler on price, or they fail to match the riding dynamic. Yamaha are here to change that. 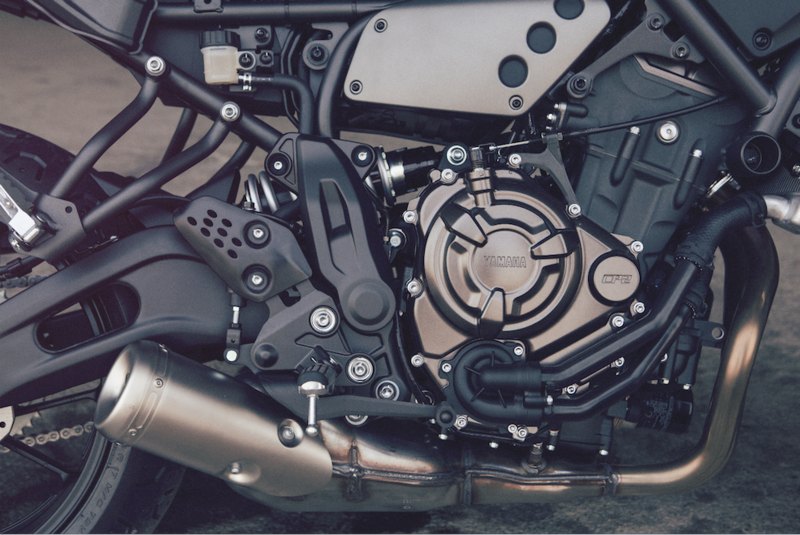 XSR700 is obviously based on the MT-07. That’s no bad thing when you consider the vast sales figures the MT range has achieved for Yamaha. Before you sneer at the notion of a manufacturer making the most of parts from other bikes in their range, remember that we’ve never had it so good in terms of the amount of styles of bike available. They’re all at it and when the parts are as good as the ones used in the MT-07, I for one can forgive using them on the XSR. The chassis is also from the MT-07 but uses the motor as a stressed member meaning the bottom section is different. The rear subframe has also been modified. Suspension is unadjustable at the front, but completely capable of everything you’ll need short of the fast group at Suzuka. Rear suspension is a laid back monoshock, nothing fancy but perfectly acceptable within the boundaries of this price point. Another quick peak at Scrambler dimensions yields a few more similarities, but you only need to look at the Yam’ to see that they’re the same kind of bike. ABS brakes are standard, monoblock calipers cling onto the front wheel and a single piston caliper takes care of everything out the back. 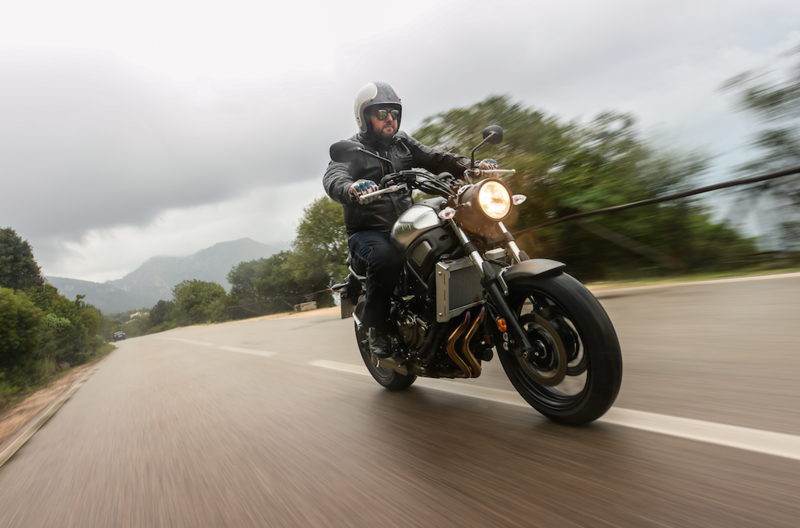 The XSR rolls on Pirelli Phantom Sportcomp tyres, the design is period perfect but they have all of the features of a modern tyre (grip), which is handy. Slide the starter switch towards you and the parallel twin slips into life. The sound is nice, if not a little muted on tick over. Slip a gear between your feet and you’ll begin a ride that, regardless of destination, is guaranteed to paint a smile on your face. The XSR fuelling is impeccable, third or fourth gear proving just as useable at slow (round town) speed as first and second. 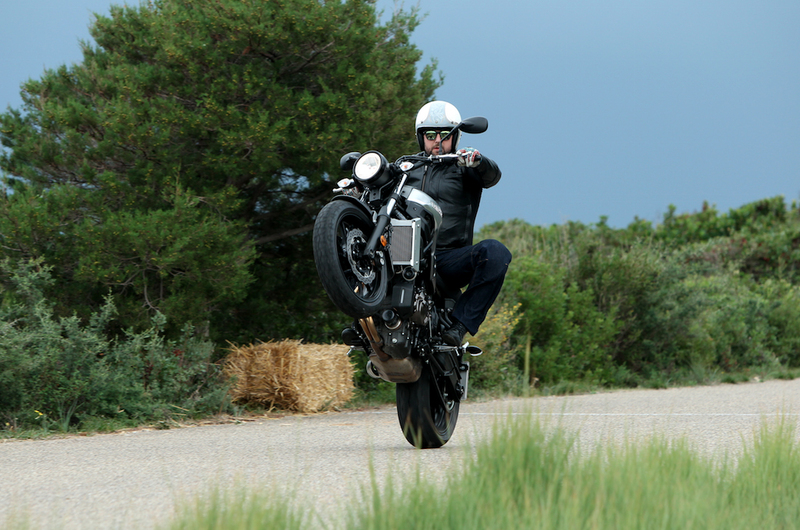 It took about 150 metres before I popped the first of about three hundred playful wheelies, the XSR seemed just as happy on one wheel as it did on two, who was I to say no? That cute looking clock set displays everything you need, even in direct sunlight. 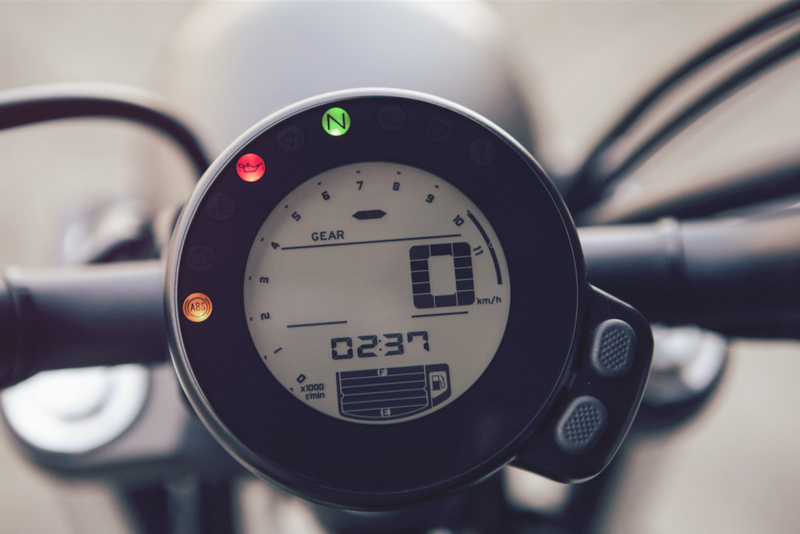 The gear indicator in particular is worth pointing out to those of you that are new to bikes. I thought when I first checked the bike out that the switches across both bars appeared quite small, but didn’t have any problem finding what I needed when I needed it. We spent a day on some stunning roads in Sardinia, which seemed to be manned by packs of barking dogs. The horn got a pretty good workout and seemed to do the trick whenever the hounds tried to hitch a ride. I went through my usual routine of squishing, pushing and pulling on everything I could find and had to remind myself that this is a six grand bike. The suspension felt basic but capable, exactly what you should expect for the price. The brakes are really good, lever feel and performance are well matched. I thought the rear brake pedal had too much travel in it and would want to dial that out if this were my bike. The action was useful, just a bit too much travel for me. I was surprised by the performance of those funky looking Pirellis. It didn’t take long for our snake of press bikes to up the pace on the twisting roads, the bike changed direction really fluidly and there was grip aplenty. After four or five passes at the first photo stop, the rain crept in. It would follow us around all day, eventually soaking us. This meant the tyres would have even more work to do, not that they seemed to mind. When we wanted to, the bikes would sit up over a hundred miles an hour in comfort. Sixth gear has long enough legs for the job and the motor didn’t feel strained at all. I didn’t get a chance to max it out, but think 125mph would be within reach. I had zero protection from the elements and was riding in an open face helmet (something I do a lot) and didn’t feel like I needed the accessory screen at any point, even when the rain was stabbing at my face like a thousand needles. We cracked on regardless of the weather, the road surface swapping from brand new to pretty ragged in places. 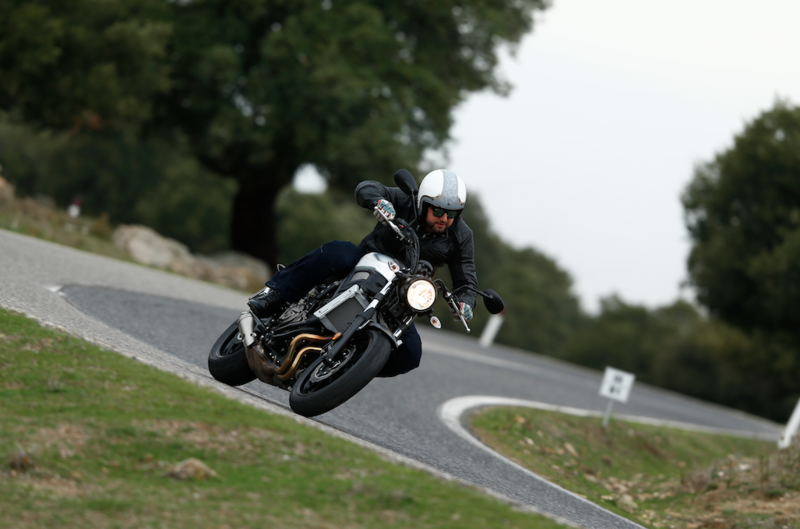 Whenever I could, I made sure to bounce the bike through as much of the crappy stuff as possible, the XSR was more than capable of keeping me confortable at the same time as retaining a sure footed feel. Again I had to remind myself that this is a bike that’ll cost less per month than an Oyster card for many people. It was turning out to be everything I’d hoped since seeing the first shots of it a few months ago. After about a million rubbish wheelies, I arrived at the lunch stop to find a couple of police cars waiting, not good. Turns out the nice people from Yamaha had closed the roads for a spot of pre lunch drag racing. The rules were as simple as the bike. You had to start in neutral with one hand on your head, when the flag dropped you could go for it. So we did. Years spent playing at traffic light GPs in London gave me a decent advantage and I managed to make it to the final three, beating the other Brit’ riders along the way. I got a bit of beard in my eye and bogged the start against a Frenchie stunt rider, so I missed the final. It was great fun and also another chance to prove the ability of the Yamaha. 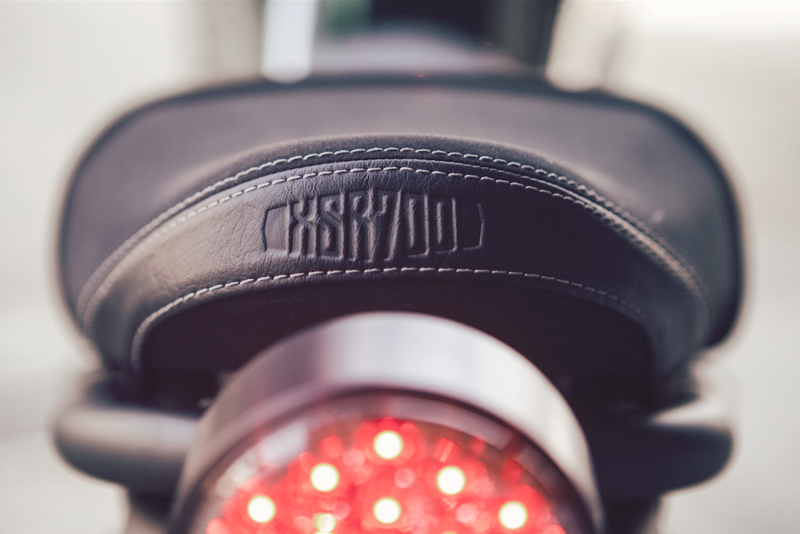 Easy to launch (even with a cigarette on the go) and not so full of power that you had to tread too carefully, you wont have to worry about not keeping pace with anything else when it comes to city riding. If anything, the masses of steering lock and upright riding position mean this bike will prove to be a bit of a rod in town. I’d probably pull the ABS fuse to help with skids, but would only end up regretting it the first time someone stepped out in front of me. Lunch was a good time to try and answer a question I’d formed on the ride. By creating a mass-market version of something that has emerged from an underground scene, are manufacturers not in danger of diluting what makes this style of bike cool by making it too mainstream? I gave up trying to figure out the answer, but I did question why I’ve spent the last two years building my own SR500 Café Racer when I could just plonk a key in one of these and wheelie my way to work in complete mechanical confidence everyday. Back on the road with the rain giving us an absolute pounding, we crept along the kind of coast road that knee down fans could only dream of (unless they live in Sardinia). I had some more time to think in between soggy wheelies and more dog dodging. I know it’ll take a back-to-back test with the Scrambler, but my money is on the Yamaha in terms of straight line performance, it’ll be a close run thing in every other area. With one eye on the digital fuel gauge (I was into reserve at the end of the 210km ride), I spent the time figuring out which of the accessories I’d go for from the sizeable list that’ll be available to you. I’d start with the loud exhaust and take it from there. 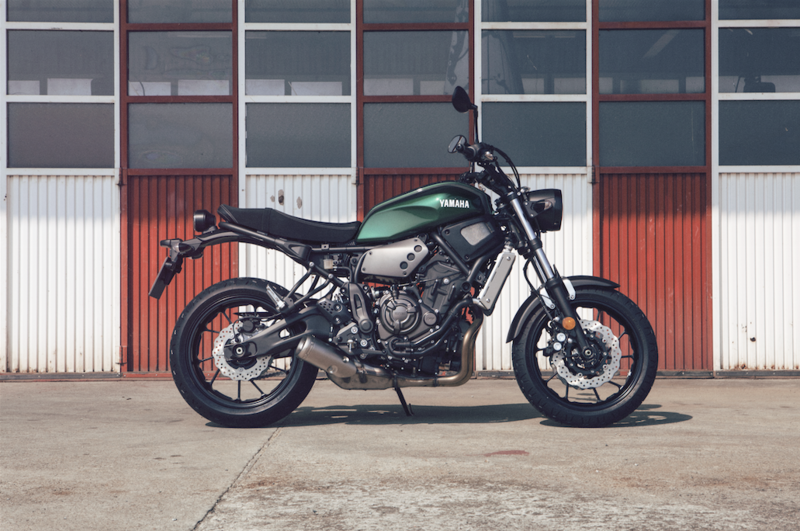 There’s an app available so that you can build a virtual version of your ideal XSR before you even bloody a knuckle in the garage, if you get a minute, check it out. In my humble opinion, dynamically speaking it’s not a bike that feels like it needs much doing to it, though Yamaha were keen to point out that it should be viewed as a neutral platform for owners to build something individual based on looks, rather than out and out performance. I know that’s kind of the point with bikes like this, but it’s just as important to remember to have some fun and for £6249, you’d be hard pushed to find a bigger smile for your new bike money. Now that you’ve read the review and have the facts, you can watch our video notes from the launch.